Our Amazing Place Community Treasure Hunts involve local residents of all ages following a trail through their community. They stop at a number of stations where a fun challenge, activity or task is completed and traded for a stamp for their ‘passport’. It’s all about having fun, connecting with others and discovering local treasure – special people, landscapes, resources, projects, facilities, groups, and services. Community treasure hunts really are an amazing community building tool – ask Mt Victoria, Caversham, Albany, and Victory who have all run events in 2014/2015. 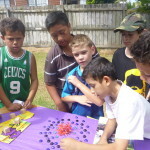 Violence Free Waitakere has a great set of Treasure Hunt resources and a learning network in place that can support you to run your own treasure hunt.